I have looked at every build diary on this website and continue to be in awe. The ingenuity and craftsmanship going into the cars and bikes people are building for LSR is very impressive. This project will NOT be known for ingenuity or craftsmanship. While no racecar project is cheap this one is about as cheap as I can make it. My ‘shop’ consists of half of our two car garage in my condo. My ‘team’ is myself. I don’t have a trailer and if I did, I don’t have a heavy enough vehicle to pull one. My sponsor is my wallet and although we live comfortably I am not in any danger of being hit by a tax on the rich. I have no welder which makes sense since I don’t know how to weld. My ‘lathe’ consists of a collection of flat and round files. When the car is complete I will probably put a “Driver Has No Cash” sticker on it. Way back about 8 years ago when I got the bug to go LSR the dream was to build a very small streamliner with a small (250cc) engine and try to set the world record in the FIA class for 250cc unblown engines. I had engines left over from my dirt track microsprint days. How hard could it be? I started to follow this website and set up an account under the name “LittleLiner”. That is why a guy building a Gas Coupe is called Littleliner. The more I looked at the sport, the more reality set in. No way was I going to be able to build a streamliner. . . . I sold all the 250cc stuff I had and I went to plan B – build a Gas Coupe. (see http://www.landracing.com/forum/index.php/topic,4642.0.html ) but I really want to go to Bonneville and hopefully get a record. So I sought a class with an open record. Near as I can tell, at this time (November 2009) no one has built a J/GC. Now all I needed was a car and an engine . . . how hard could it be? remember the Beltway Bandit story. Very cool! Looking forward to the new car! Good luck with the build. Post many photos and ask questions. Step 2: Get an engine: J Class is for engines 31 to 45 cubic inches (approximately 501cc to 750cc). I wanted a stock production engine for reliability. I decided to go with a motorcycle engine because they have a high power per pound ratio. Motorcycle junk yards didn't have what I wanted at the price I wanted to pay. So I turned to ebay. When looking for a motorcycle engine on ebay you run across the term “Car Kit”. A Car Kit engine is one that is all together and includes the complete intake system, starter, wiring harness and sometimes even includes the radiator and/or the exhaust system. I wanted a Suzuki GSXR750 engine but was getting outbid on the ones I liked. So I decided to look for something almost as good as a GSXR750 and settled on a Honda CBR600RR. These engines redline at 15000rpm and produce stock horspower in the 110 to 118 range depending on the year. Torque is around 45 to 50 ft lbs. The transmission is a six speed. If my back were not so messed up I could lift the entire engine without help. These engines are light and very compact which really helps when performing a swap into a car. Next step - get a car. This has me interested so I started looking on our local classifieds here in SLC. If I were in your boat I kind of like the Honda Del Sol. Looks pretty sleak, light, and there where quite a few for sale cheap. Just a thought. The Del Sol is a two passenger car which puts you into GT or Modified Sports. There have been posts in the past here about wether a Honda Motorcycle engine would be legal in a Honda car (Del Sol, Insight, S600 etc) in GT. I think the conclusion was that it would not be considered a car engine and not be allowed in GT. Now there is Modified Sports (MS) available but the "lowest" SCTA engine class in MS is class I for engines between 751cc and 1000cc. I am running Gas Coupe but intend to change the car over time to run in Altered and eventually in Competition Coupe. With a sports car you are stuck with only Modified Sports. Also the Del Sol is front wheel drive. That creates some issues when running a bike engine. Wait for my posting about how I am mounting the engine and I will reveal some details that might help someone with putting a bike engine in a FWD car. I'm looking at the Metro/Sprint line for a GC, you are way ahead of me in that you have th eparts and have participated at Maxton....mine is prolly just a dream. I am very familiar with the Metro Gnome team. I have spoken with the owner/driver. I have also been in contact with the guy that helped build the car originally (PSI man). He profided me with the bearing hangers we are using to hold the diff in place. But we are getting way ahead of the story . . .
You see before the Geo there was a Chevette . . . . Step 3: Find a car that fits the class. In 2004 I bought a 76 Chevette. It met my two criteria - It was small and cheap. But it had one major challenge and that was fitting a motorcycle engine up front in a rear wheel drive car. I had removed the unneeded stuff like engine, trans, interior and I was moving along (slowly). By the end of the Summer 2004 I had made very little progress other than stripping the Chevette. At that time we sold our house and I had to put the car in storage while our new place was being built. Then I met Tom Bruch. Everybody knows Tom. It was the October 2004 meet at Maxton. At that time he was running a Geo Metro 3 cylinder with a Turbo and was setting several records including one pass just short of 131 mph. 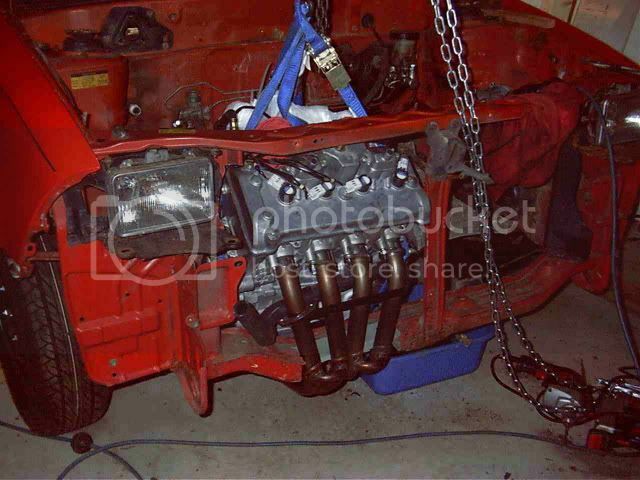 I began to think that perhaps I could fit my Honda engine to a Geo transmission and run a Metro instead of the Chevette. By April 2005 I was settled in the new Condo and the Chevette was occupying the left side of our new two car garage. I built an engine hoist frame out of 2x4s and got back to work. After struggling with the issues presented by the Chevette/Honda swap I was beginning to think that this was a major mistake. Progress slowed to a standstill. The header would not clear the steering box and the engine had to be offset to the right which created all sorts of problems with the driveline design. Seemed like a Metro would be a better foundation for my gas coupe so I scrapped the Chevette. Back to ebay . . .
Ebay can be a strange experience. Ive bought and sold a bunch of stuff there. My rating approaches 170 so there have been that many transactions at a minimum. Ive bought and sold cars, motorcycles, engines, all kinds of stuff. 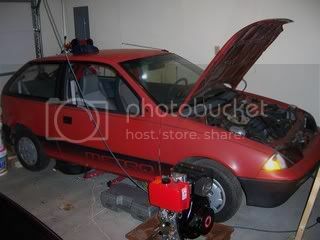 So I went to ebay to find the Perfect Geo Metro. I live in Pennsylvania. We get snow here. We cover our roads with salt to get around in snow. This really does a job on our cars. Geos are made of metal, . . not much metal, but none the less . . metal. Metal rusts. When a Geo Metro rusts the problem is that the mounts for the front suspension rot out and the car is worthless. It costs more to fix them than they are worth. So there are a good number of worthless Geo Metros for sale around here. Many are on ebay. I probably bid on a dozen Metros. Some never reached the reserve price. Some got too expensive for me. Some got snatched away through a last second sniper bid and I got aced out. I hate it when that happens. Then . 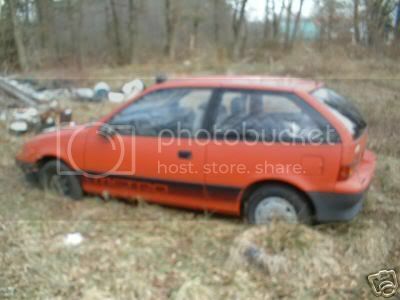 . . there was this Geo Metro, a 1990 with a bazillion miles and no title, it was not running (ran when parked) - it was only about an hour drive from here - it was only a 5 day auction and only two days were left, - the bidding had started at $50 and there was only one bid  no reserve - the high bid would win. I figured it was probably rusted out. I email the seller to ask about some details. Never got an answer  so I bid $51. What the heck? Maybe there were a few good parts I could use when I found the right car. It was actually in better shape than I expected. As best as I could tell there was little to no rust. The body had almost no damage, only a few very small dents, all the glass was good It would be five weeks before the field dried out enough to get the car out. Part of the negotiation included me waiting till it was dry so his fields would not get all tore up pulling the Geo out. I eventually flat towed it home with a tow bar, washed it and put it in the garage. Not bad for $51.00. If you look close you can see the stash of acorns that field mice had put in the air cleaner housing . . . . So . . all I have to do is swap engines and go racing. How hard could that be? Gas Coupe rules restrict the design and modifications for this project. Two key gas coupe rule items that have driven the way I approach this are (1) “FWD cars that have been converted to rear wheel drive are not permitted in this class” and (2) the requirement for at least one of the following modifications to be used: - a non-stock supercharger, a quick change rear, or an engine swap. How hard could it be? Retain Front Wheel Drive and swap in the Honda engine. All I have to do is order up an adapter to mate the Honda to the Geo Transaxle. . . OK, . . bad idea. The initial plan was to fabricate a short (very short) coupler to join the Honda output shaft to the input shaft on the Geo Transaxle. The Honda clutch would be retained and the shifting would be applied to the Honda 6 speed. The Geo 5 speed and reverse would be retained but be set on one gear and not shifted during the running of the car. Think of the transaxle as a “quick change” with 5 speed and reverse. So I pulled the geo engine. Lowered the Honda into position and realize that . . .well . . it didn’t fit. The Geo transaxle sits on the left side of the engine bay with the engine on the right. The Honda was just a little too wide. To clear the bell housing would require cutting into the “frame rails” in the uni-body. Decided not to go that way. Which left the option of cutting away some of the bell housing to allow the Honda to drop in. 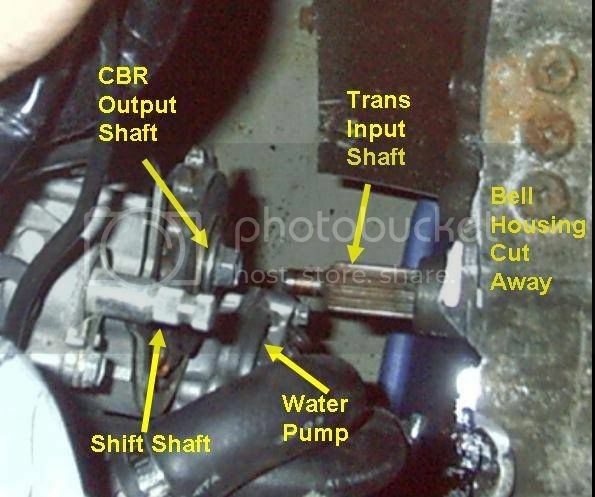 The photo shows the cut bell housing and the critical components that all had to fit. Also with the engine in this position it was lower than I wanted it to be. So for ground clearance I would have to get the oil sump modified. There was also limited ground clearance for using the Honda exhaust header which runs under the engine on either side of the oil sump. Interference caused by the water pump and cooling hoses prevents installing any sort of universal in the coupler making engine to the transaxle alignment very important. Early ‘test fit’ of engine next to transaxle . . .
. . . .So in review. . . A) the engine will barely fit. B) I need a very special one-off coupler. C) There is no room for a universal joint. D) So I will have to build some sort of mounts that hold the engine and transaxle in perfect alignment. E) The engine is too low in the car and will require custom headers and an oil pan sectioning job to get anything reasonable in ground clearance. At this point I decided to come up with an alternative plan . . .
Did you consider ditching the factory transaxle, and making a center shaft with a sprocket on it to connect the stub axles? This way you'd be a spool, incur only one transmission loss, and have more ground clearance. The motorcycle engine probably wants closer gear ratios than the Sprint has in it, and you'll be able to change top gear ratios easy by changing countershaft sprockets. Pat types faster than I do. Agree 100%. Looks like it would be less machining too. J.B.
How about taking the rear live axle from a quad and re-drill the wheel flanges to match the bolt pattern of the c/v joints? 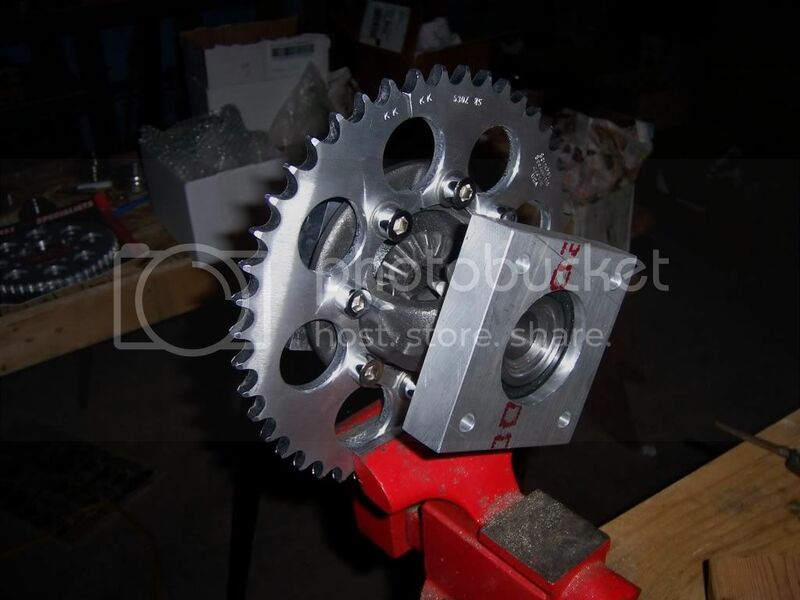 Already has a sprocket, You`d just have to mount it w/ carrier bearings and there are,no doubt,all sorts of after market ratios available. This is like watching the movie after reading the book. Methinks he has it figured out already and is just showing us his timeline of attempts gone awry. May I assume you guys are suggesting something like this in place of the transaxle?